I saw this INFOGRAPHIC from Salesforce.com and knew that I had to add this to my blog as it represents what how I view what I do. Everybody thinks they know the story of David and Goliath. The story as most people know is the epic battle from more than 3,000 years ago of an underdog shepherd boy defeating an experienced warrior giant with nothing but a simple slingshot. In Malcolm Gladwell’s new book, David and Goliath: Underdogs, Misfits, and the Art of Battling Giants, the notion of David as the underdog is refuted. People view David as the underdog because he was just a kid, a shepherd versus an experienced and more well-equipped warrior. No one else in the Israelite army stepped up to fight David because it was thought to be a futile gesture which would likely end in death at the hands of the giant. But this is where people make a mistake and misunderstand both David and Goliath. For all of his size, Goliath’s size probably had a medical side effect that caused his vision to be very weak. And despite David’s small stature, his weapon of choice – the slingshot – was a highly effective and lethal weapon in the hands of someone who had been using the slingshot for his entire life to defend his sheep from predators. Instead of David being the underdog, Malcolm Gladwell posits that David won the battle because of, and not despite his size and choice of weapon. In essence, David’s seeming disadvantages turned out to be competitive benefits for him. What lessons can we take away from Gladwell’s re-examination of this classic tale? In business, we have similar stories where we have small and nimble upstart companies who need to compete against large, formidable companies with tons of resources. However, both size and resources can serve as stumbling blocks to the larger companies in situations where rules are changing and where the attributes of speed, flexibility and adaptability become virtues. David’s use of a disrupting technology, his nimbleness and his ability to change the rules were able to win the day. In the same way, smart companies today are thinking about the competitive environment in the same way and applying David’s attributes to beat their competition. You can view Malcolm Gladwell’s own interpretation of David and Goliath in the recent TED video below, read about it in his interview with Inc.com or view the NY Times book review of “David and Goliath”. 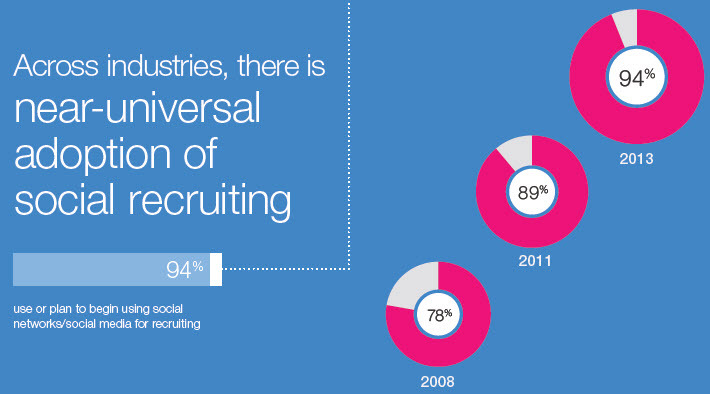 What Are You Doing With Social Recruiting? What Are You Doing About Your Talent Brand? Talent Branding is one of those buzzwords that is rapidly growing in popularity among companies of all sizes. 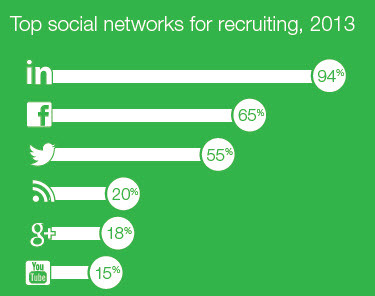 LinkedIn recently presented their top 5 recruiting investments for 2014, and investing in Talent Branding was #2 on their list. Where to invest time and budget is a question that all companies ask and the LinkedIn Global Recruiting Trends Survey identified the top 10 channels for communicating talent branding. The Company Website continues to lead as the place where most companies invest their efforts, but online professional networks (like LinkedIn) showed the largest year over year growth. One of the top tasks you can undertake is to standardize the LinkedIn profiles for each of your employees to include the key marketing messages for your company. The profile of every employee on LinkedIn is essentially a micro-marketing site and very few companies are leveraging this potentially valuable marketing real estate. And the best thing about standardizing and updating LinkedIn profiles is that this initiative will cost you nothing except for the time to develop, train and roll-out a standard template for your employee’s LinkedIn profiles. LinkedIn even has a new feature where users can upload presentations or other collateral to their LinkedIn profiles and this would be a great way to include a standard marketing deck or product information for your company. You can view the entire LinkedIn presentation on the “5 Recruiting Investments You Need To Make in 2014” below and you can watch their webcast at this link.